Atrial fibrillation is the most common irregular heart rhythm, affecting about 2.5 million people in the US, with more than 200,000 new cases of atrial fibrillation are diagnosed each year. Atrial fibrill ation is an abnormal heart rhythm originating in the upper chambers of the heart (atria). Several impulses begin and spread throughout the atria, causing a rapid, irregular and disorganized heartbeat. Ask what medications you are allowed to take. We may also ask you to stop other medications (such as Coumadin (warfarin) and/or aspirin products) several days before your procedure. Your INR (a blood test to evaluate blood clotting) must be within a suitable range to undergo the procedure. If you have diabetes, ask our office how you should adjust your diabetic medications. Do not eat or drink anything after midnight the evening before your test. If you need to take medications, drink only with a small sip of water. Your ablation will take place in a special room called the EP (electrophysiology) lab. Before the test begins, a nurse will help you get ready. You will lie on a bed and the nurse will start an IV (intravenous) line. This is so the doctors and nurses can give you medications and fluids during the procedure. Your groin area will be shaved and groin will be cleansed with an antiseptic solution. Sterile drapes will be placed to cover you from your neck to your feet. The procedure is done under general anesthesia. A anesthesiologist will remain at the head of the bed and will constantly assess you. The doctor will insert several catheters into a large blood vessel(s) (in your groin or rarely neck) and advanced through the blood vessels to your right atrium. A needle is then used to place the catheters through the septum into the left atrium. 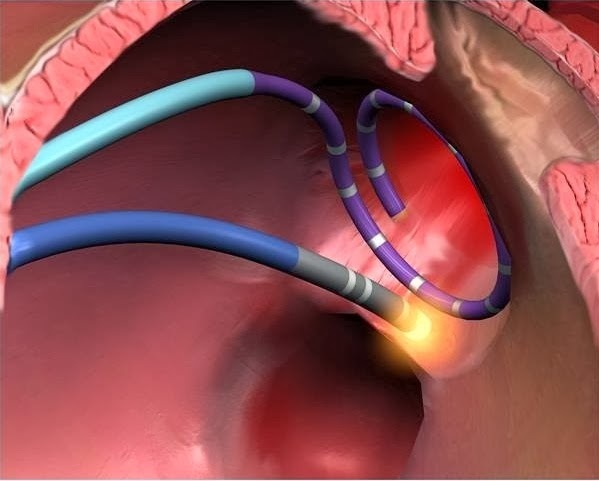 The catheters are used for mapping (searching for the electrical impulses that fire abnormally, causing atrial fibrillation) and the delivery of energy (ablation) to the area. Intracardiac ultrasound, performed by a catheter transducer inserted into the heart, may be used and is for viewing the structures of the heart and determine exact catheter position as well as insuring safe energy delivery. The ablation is performed by delivering energy from a catheter to the area of the atria around the pulmonary veins producing a circular scar. The scar will then block any impulses firing from within the pulmonary vein and tissue arround the veins from entering the heart, thus preventing atrial fibrillation from occurring. The process is repeated to all four pulmonary veins. In some cases, ablation may also be performed to other parts of the heart such as the posterior wall, left atrial roof or coronary sinus. Once the ablation is complete, your electrophysiologist will use monitoring devices to observe the electrical signals in the heart. Atrial fibrillation ablation has approximately 85 % success rate in eliminating atrial fibrillation with the first procedure. The physician will remove the catheters from your groin and apply pressure to the site to prevent bleeding. You will remain on bed rest for 6 hours. After your ablation, you will be admitted to the hospital. You will be taken to your room and placed on a special monitor, called telemetry. Telemetry consists of a small box connected by wires to your chest with sticky electrode patches. The box causes your heart rhythm to be displayed on several monitors on the nursing unit. The nurses will be able to observe your heart rate and rhythm. Before you leave the hospital, we will discuss the results of the procedure with you and your family. We will also tell you when you can resume activities and how often you will need to have follow-up appointments. If you have any other questions, please call our office. You will have a small sterile dressing on your wound over your groin. It may removed the next day. Call our office if you notice any redness, swelling or drainage at the incision site. Do not be surprised if you are in atrial fibrillation after the procedure. The first 8 weeks post-ablation, many patients experience palpitations (skipped beats) and may have atrial fibrillation. Drug therapy or cardioversion may be indicated. You may be required to take a blood thinning medication, such as Coumadin (warfarin) for one to three months after the procedure. You will be required to have a blood test, called an INR, on a regular basis so the doctor may evaluate the dosage. The INR must be kept between 2.0 and 3.0 during this time is on coumadin. Alternatively, you can be on newer anticoagulants (Dabigatran, Rivaroxaban, Eliquis) that do not require any INR monitoring. In about 3 months, the heart heals and the palpitations gradually lessen in frequency and intensity. At that time, medications are reduced and then stopped. You will need to come back to see us for a follow-up appointment at three months. At that time, you may undergo an ECG, event monitor and echocardiogram. If you are still in atrial fibrillation, you may require a repeat ablation procedure. As you are resting during recovery, the electrophysiologist may discuss some of the findings with you. However, a complete, detailed report may take more time. Regardless of the results of your study and the course of treatment your physician recommends, you play an important role in staying healthy. Be sure to keep all appointments for exams and follow-up tests. Follow your instructions, don’t hesitate to talk about your concerns, and immediately report any new symptoms. As always, if you have any questions about your health, be sure to call our office.